Cats Protection’s annual celebration of extraordinary felines isn’t too far away. 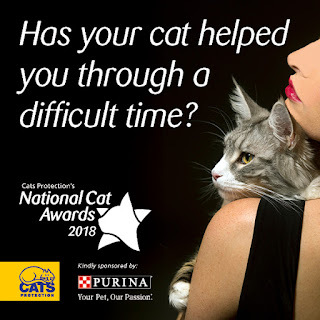 It’s time to get set for the National Cat Awards 2018. Over the next few weeks, we’ll be announcing the finalists for each of the seven categories, including Furr-ever Friends, Hero Cat, Most Caring Cat, Outstanding Rescue Cat, Purina® Better Together and Cats Protection’s Special Recognition Award as well as the Star Team Award, which focuses on our fabulous volunteers. From stories of great companionship to inspirational tales, the National Cat Awards highlight the special bond between cat and owner. This week, we meet the finalists of the Most Caring Cat category. Meet the finalists: Arthur, Awol and Ted in our video playlist below. Winners will be announced at a glamourous ceremony on Thursday 2 August at London’s Savoy Hotel, where celebrity judges will also announce the National Cat of the Year 2018.